Wow! What a great turnout for our used-book sale during 2018 Cascade Days! Special thanks to John and Gail Boggs for sorting all the books prior to the sale and coordinating the many volunteers who set up book-covered tables for the sale and helped people find those special books. We really appreciate everyone who donated books, bought books, donated money to support the library, and/or volunteered to help. The sale brought in $2,200, and all proceeds will go to support library programs and events! The Foundation's held its 2018 Annual Members' Meeting on March 25, 2018 1- 3 PM at the Concrete Theatre. We started with library updates, volunteer awards, and a brief business meeting and then heard from our guest speaker, Anu Taranath, from the Humanities Washington speakers bureau. Her talk was entitled: “Not Just for Kids: How Children’s Literature inspires Bold Conversations”. Read more about Anu and her talk at https://www.humanities.org/speaker/anu-taranath/.​ The minutes for the 2018 meeting can be found here. Poet and performer Judith Adams was the guest speaker at the our 2017 Annual Members’ Meeting. The meeting was held March 19, 2017 at 1 PM in the Concrete Theatre. Judith was born in England and now lives on Whidbey Island. Judith is on the Humanities Washington Speakers Bureau, a roster billed as “Fascinating Talks by Fascinating People”. 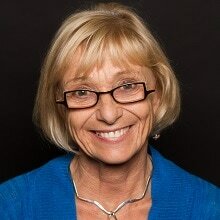 Judith’s talk in Concrete is entitled “A Fierce Language: Falling in Love with Poetry”. Judith successfully “drew on diverse poets …to take us on a journey to discover the music, power, humor, and strength of poetry, showing how it can radically enhance, change and even save our lives. Judith talked about the joy of reciting poetry by heart. After her talk she was eager to hear about poetic experiences of people in the audience. Concrete resident, Leia Vilardi, provided viola music to accompany Judith's poetry readings. The event was free and open to the public. The meeting included announcements and a brief business meeting before Judith’s presentation, as well as opportunity for members to pay their 2017 dues ($5/per person) and purchase Judith’s CDs and books. Co-sponsors of the event were Upper Skagit Library Foundation, Concrete Theatre, and Upper Skagit Library. Karen Smith and Don Smith have donated nearly $500 to the Foundation from sales of their children’s book, “My Name is Twirp”. Karen wrote and Don illustrated the fun book, and they intend to donate $1.00 for each book sold in the future to support the library. You can purchase the book locally at 5b’s Bakery or Northwest Garden Bling, or through Amazon. Thanks to everyone who helped make this year's Cascade Days Book Sale/Donation Drive a success! Special thanks go to John and Gail Boggs, who pre-sorted all the books with Brad Sukolski, marshaled volunteers and tables for the event, and on top of it all, donated the parts & labor to produce the terrific large canopy that provided welcome shelter on such a hot day! First, I want to say that we had a record-breaking sale/donation drive during Cascade Days and brought in a whopping $1825. We did a few things slightly different this year, but our success was not due to any cosmetic changes; our success was due to the great team of volunteers who continue to support the Upper Skagit Library that is near and dear to all of us. There were even some people who just showed up to help and did so with a smile, which allowed some of us who were getting a little worn out a reprieve. That too, was much appreciated. I make no secret of being terrible with names and I didn’t feel the need to clock people in and out from their scheduled shifts, but I enjoyed working with all of you. Gail and I feel privileged to be part of your group and the greater library community. Note: When all was said and done, the sale/donation drive raised over $2000! Thank you to volunteers, book lovers, and donors who made this possible. The funds will be used to support the Upper Skagit Library! ​FROZEN in CONCRETE -- it was a MAGICAL, SOLD-OUT event! 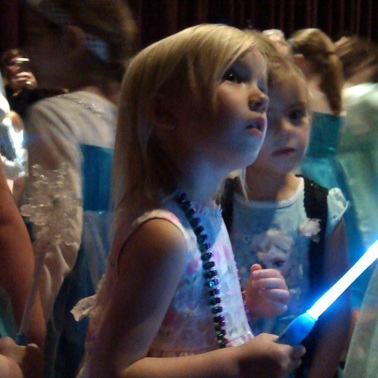 Concrete Theatre was packed with children dressed as Frozen princesses or as Olaf on Saturday March 5th! They listened enthralled to author Barbara Jean Hicks, The Story Queen, read from her beloved companion books to 'FROZEN'. Barbara Jean spoke with every child who wanted her autograph in their copy of her books. It was magical to see the crowd of children -- and many parents, too! -- sing and dance along with Anna and Elsa, who were brought to life by performers from Emerald Kingdom Parties. Attendees were treated to Frozen-themed refreshments from 5B's Bakery. Lucky attendees left with wonderful raffle prizes, including princess capes handmade by Sacha Buller, and a snowflake-making party donated by Brooke Pederson. Children had their pictures taken with the Frozen princesses, thanks to Sheena Daniels from SD Photography. We thank our special guest, author Barbara Jean Hicks; Val Stafford and the Concrete Theatre; Em Beals and 5b’s Bakery; Sheena Daniels from SD Photography; Emerald Kingdom Parties; Concrete Mayor Jason Miller (aka Olaf); the Upper Skagit Library District; Slav Kislyanka of the Upper Skagit Library for beautifully designed event posters; Jude Dippold, who captured the event on camera; the event planning committee (Cora Thomas, Em Beals, Sacha Buller; Stephanie Morgareidge); and the many other volunteers who made this event special for attendees. Some families traveled for hours to take part in this magical day! The event not only raised funds for the Upper Skagit Library’s new home, but it also helped spread awareness about the project. Thank you all! Sunday, March 6, 1-3 PM -- Annual Members Meeting of Upper Skagit Library Foundation at Concrete Theatre. Updates, announcements, volunteer awards to John and Gail Boggs and Greta Movassaghi, a short business meeting, and a talk by Barbara Jean Hicks about her experiences becoming an author of popular children's books. Minutes are posted here. This event was held October 3, 2015. Award winning local author, Nicola Pearson, entertained the audience by reading from from her newest mysteries, The Case of the Barking Dog and The Man in the Mud Room. She explained her writing process, answered questions, and autographed copies of her books. Thanks to Nicola’s generous donation of her books, time, and talent, more than $300 was added to our new-building fund at this event, We also have Cora Thomas to thank for organizing the event and the full audience of enthusiastic library supporters who made donations and purchased signed copies of Nicola’s books at the event. The 2015 “I Love My Librarian Award!” recognizes the accomplishments of librarians in their efforts to improve the lives of people in their community. Up to 10 librarians will be selected to win $5,000, a plaque, and a travel stipend to the award ceremony in New York. Nominations were accepted until September 28 2015. The award is supported by the Carnegie Corporation of New York, The New York Public Library, and The New York Times and is administered by The American Library Association. To nominate our favorite librarian, Brooke Pederson, visit www.ilovelibraries.org/ilovemylibrarian. We raised more than $1600 at the Cascade Days book sale and Marblemount Community Market book sales during the summer of 2015. The funds will support library programs, card scholarships, and special items to enhance the library’s services. Thanks to many volunteers, especially Nancy & Steve Johnson and Gail & John Boggs, and our generous customers. The highlight of the evening was a talk by Nancy Pearl, the award-winning librarian who is regularly heard sharing her love of books on National Public Radio's Morning Edition and Seattle's NPR affiliate KUOW. We celebrated many key milestones reached for the library and its expansion plans and talked about what lies ahead. * Many announcements, including the great news that the capital project fund has grown to more than $600,000, were met with loud applause and the blowing of party horns. ** Nancy Sparkowich, Steve and Nancy Johnson, and past board members were recognized for their longtime service and dedication, and Brooke Pederson was thanked for her first year as Upper Skagit Library Director. Nearly 100 people, including many new faces, attended the proceedings and enjoyed Nancy's presentation.